In recognition of the fact that the lack of well-developed infrastructure has hindered the country’s development, Budget 2016 has placed high priority on infrastructural development. Minister Jordan said the existing road network is unable to deal with the rapid growth in vehicular traffic over the last decade, the consequences of which are many. 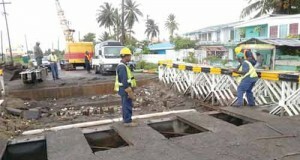 Giving an example, he said the recently-expanded East Bank Demerara road is already incapable of accommodating the flow of traffic into the country’s capital, while the East Coast and West Coast roads can be harrowing during rush hours. Therefore to address this situation, Government has concluded a sustainable urban transport plan, which includes, among other things, a traffic model for Georgetown, a parking management plan, regularisation of mini-bus operations, provision of public transport facilities, and the use of public transport and non-motorised modes in the most congested areas, the Finance Minister explained. The surface and bridges on East Coast Demerara Railway Embankment are earmarked for improvement. Further, $14.4 billion has been allocated to continue the upgrade, expansion and rehabilitation of roads and bridges. He informed that negotiations are being finalised with the Government of China for the construction of the East Coast Highway, from Better Hope to Belfield. Over $5 billion will be injected into the reconstruction of Sheriff Street that will facilitate improved traffic safety features, including pedestrian overhead crossings at strategic locations. Soon a US$50 million loan will be signed with the Indian Government to build a new road link between Ogle on the East Coast of Demerara and Diamond on the East Bank of Demerara. This new road will intersect several communities, including Sophia, South and North Ruimveldt, Eccles and Providence, creating an alternative access route to these densely populated areas. In so doing, business opportunities will open up, as well as new lands for housing development. The sum of $2.3 billion will be invested on the upgrade of the West Coast Demerara Road, from Parika to Vreed-en-Hoop. Recognising the daily challenges faced by motorists and commuters and traffic bottlenecks created due to the current aged floating bridge across the Demerara River, money has been allocated for a feasibility study for a new bridge. “We must construct a fixed high-level bridge to facilitate easy commute and allow for improved river navigation. We are committed to this project and, in this regard, have made provision, in this budget, for the conduct of the feasibility study. This is the first step to realising a public-private-partnership for construction of the bridge,” Minister Jordan stated. The hinterland has not been left out of the infrastructural agenda. The Government will pursue several initiatives, in an effort to expand the integration of road networks into the intermediate savannahs. A total of $6.72 billion has been allocated for the improvement of hinterland, rural and urban community roads in Bartica, Mahdia, Ituni/Kwakwani, Puruni/Itaballi, Mabaruma and Port Kaituma/Baramita and the Sophia ring road, among others. In the interim, critical works will be undertaken to preserve the highway’s upkeep. Concurrently, maintenance works will be undertaken on the Linden/Kwakwani corridor. Upon the finalisation of negotiations with government’s development partners to build the Parika-Goshen road, an alternative link to Bartica and other hinterland communities would be created. More resources have been made available to expand efforts currently being undertaken to improve farm-to-market access roads at Parika, Ruby and Laluni. Upon conclusion of negotiations with the Government of India, new river transport vessels to improve river connections between the coast and riverain areas and remote regions will be acquired. In addition, private financing is being explored for the purchase of at least two, semi-new vessels. There will also be emphasis on navigational aids and improving stellings and wharves. Government has begun preparations to access the UK–Caribbean Infrastructure Fund (CIF), to upgrade and reconstruct several facilities in Georgetown, Parika, Port Kaituma, Kumaka and Bartica. The Government will aim to secure funding, through the UK-CIF, to purchase a dredge that will be managed and operated in collaboration with Maritime Administration Department (MARAD) and the Shipping Association of Guyana (SAG) to clear river channels. The sum of $1.3 billion is budgeted for works to commence rehabilitation of the Bartica stelling and the goods wharf at Kingston; docking of dredges and ferry vessels; dredging of the Demerara and Essequibo Rivers; and installation and maintenance of navigational aids. Works will begin on a phased waterfront development programme. Estimated to cost over $1.6 billion, this programme will see the development of state-of-the-art waterfront facilities. Kitty, Kingston, Stabroek, Vreed-en-Hoop, Supenaam and Skeldon are targeted to benefit. The proposed project will include boardwalks; recreational areas; modernised ramps for ferries and water taxis, and a dockyard for yachts. The sum of $5.2 billion has been budgeted for the continued development of the air services industry that includes the expansion of the Cheddi Jagan International Airport. Government is looking for financing to upgrade hinterland airstrips at Eteringbang, Annai, Paramakatoi, Kurupung, Kato, Kopinang, Monkey Mountain and other locations. The Government is earmarking over $2 billion, in the medium – term, for its airstrips and aerodromes’ improvement programme. Over $6 billion has been budgeted to erect and strengthen sea defence bulwarks, as well as to fashion a comprehensive instrument for coexisting harmoniously with the ocean and rivers, according to Minister Jordan. To support these efforts, the Mangrove Restoration Project and the Shorezone Management Plan will focus on developing natural mangrove regeneration initiatives that facilitate eco-friendly solutions while preserving the livelihood of people living in close proximity to the sea.